Howard Shore: The Lord Of The Rings - The Return Of The King (Includes Into The West as performed by Annie Lenox). Composed by Howard Shore. For piano and voice. Format: piano/vocal songbook. With vocal melody and lyrics. Movies. 54 pages. 9x12 inches. Published by Warner Brothers. Enya, Howard Shore: Lord Of The Rings - The Fellowship Of The Ring Composed by Enya, Howard Shore. Sheet music for voice and piano. From the motion picture "Lord Of The Rings - The Fellowship Of The Ring". Format: piano/vocal/chords songbook. With vocal melody, piano accompaniment, lyrics, chord names and color illustrations. Movies. 28 pages. 9x12 inches. Published by Warner Brothers. 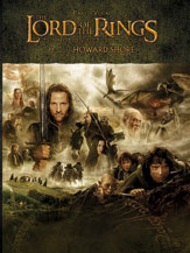 Howard Shore: Lord Of The Rings - The Two Towers Composed by Howard Shore. Sheet music for voice and piano. Format: piano/vocal/chords songbook. With vocal melody, piano accompaniment, lyrics, chord names and color photos. Movies. 38 pages. 9x12 inches. Published by Warner Brothers. Emiliana Torrini: Gollum's Song - From "The Lord Of The Rings: The Two Towers" Performed by Emiliana Torrini, lyrics by Fran Walsh, music by Howard Shore. Sheet music for voice and piano. From the motion picture "The Lord Of The Rings: The Two Towers". Format: piano/vocal/chords single. With vocal melody, piano accompaniment, lyrics and chord names. Movies. Series: Original Sheet Music. 9x12 inches. Published by Warner Brothers. Lord Of The Rings Symphonic Suite By Howard Shore. Edited by George Megaw. Sheet music arranged by Victor Lopez. Concert band. Published by Warner Brothers. The Lord of the Rings (Excerpts from Symphony No. 1) - Concert Band Score & Parts. By Johan De Meij. Sheet music arranged by Paul Lavender. Amstel Concert Bands. Size 9x12 inches. Published by Amstel Music. "Lord of the Rings" (The Fellowship of the Ring) By Howard Shore. Edited by Michael Story. Sheet music arranged by Lopez/falcone. Marching band. Published by Warner Brothers.